Quoting Albert Einstein, Azar Nafisi reminds us of the vital importance of imaginative vision for actually seeing and making sense of the universe we inhabit. Said the scientist: “I’m enough of an artist to draw freely upon my imagination. Imagination is more important than knowledge. Knowledge is limited. Imagination encircles the world.” Stripping the arts out of education doesn’t make us more certain, it makes us less agile, less able to discern what is real in the shifting landscape of experience. The result is devaluation of the human and standardization of thought. Both are ethically unacceptable, and both are costly to society as a whole. Nafisi also quotes Nabokov, who like Einstein and herself was an immigrant citizen whose passion for democracy, basic rights, and human imagination, strengthened our republic. Nabokov would tell students to work “with the passion of a scientist and the precision of a poet.” We are now, as a society, in danger of losing both. We ask scientists to be simply readers of facts, not impassioned explorers, and we misunderstand poetry as a pleasant indulgence, not as the linguistic and expressive frontiersmanship that it is. To deaden both of these for a generation of talents is to deprive our own future economy of what is most valuable: free people dignified by a capacity for the sublime and an aversion to the grave costs of dispassionate imprecision. To make all education into targeted job training, from a false and self-satisfied definition of educational efficiency, is to deprive students of opportunity in the most direct and implacable way. Can we demonstrate that a narrower curriculum adds corrosive and distortionary costs to our economy? That the question seems credible is evidence of the fact: a narrow education narrows our potential, and to narrow the potential of a generation hampers our ability to develop as a free society. Can we demonstrate that a narrower scope of education causes us to arrive more slowly at solutions, and more clumsily? Once again, we can ask this only if we have lost touch with the joyous experience of knowing the answer: a broader and more diverse education adapts the mind to complexity, preparing us to cope with emergency, adversity, and things not yet known. What Nafisi and Einstein refer to as imagination is the active engagement of the human mind, as it reaches out to experience and builds connections that are unique to each intellect. Effective education is not the delivery of raw materials; it is the active collaboration of human minds in a process that cultivates active thinking and raises our overall intelligence. To aspire to less than that is to devalue the student and limit our capabilities as a society. Yet somehow, when we think about the best use for public spending in education, we forget a very simple truth: no one really believes that a medical student will become a less able surgeon, because she also knows how to play the cello, speak two foreign languages, and make sense of Shakespeare. So, let’s pretend, for a moment, that our priority is not to create schools that intrude in no way into our public priorities, but rather to create schools that produce outcomes that constantly exceed our prior ability to address those priorities, by giving us thinkers, leaders, explorers, citizens. Reliable intellectual agility does not translate readily into numbers, nor does it fit into the geometrical assumptions inherent in standardized testing. 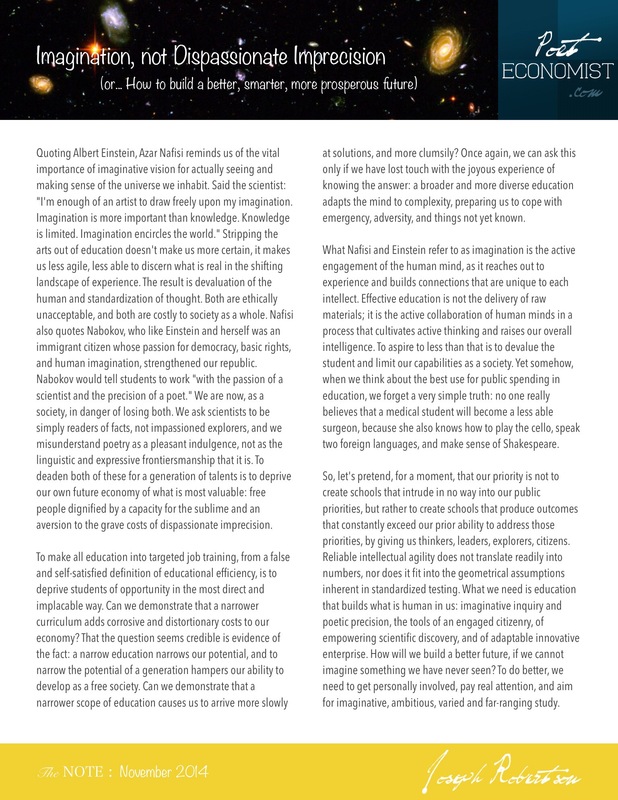 What we need is education that builds what is human in us: imaginative inquiry and poetic precision, the tools of an engaged citizenry, of empowering scientific discovery, and of adaptable innovative enterprise. How will we build a better future, if we cannot imagine something we have never seen? To do better, we need to get personally involved, pay real attention, and aim for imaginative, ambitious, varied and far-ranging study.